Imagine you have the following items in your possession. Which one(s) do you think the SMF TSA will not allow in your carry-on bag? Update: Let me give the answer. The TSA allows all of the items shown above in carry-on baggage except one: the screwdriver with bits. Without checking with you OR the airlines, my guess is that ALL these items would be prohibited from carry-on baggage, unless the hand sanitizer was 3 oz. or less. Whether it makes any rational sense seems to make little difference to the TSA folks. They seems to function like robots or computers – garbage in, garbage out. They seems to blindly follow orders from higher ups, with little to NO personal discretion allowed in the performance of their job. Actually, only one of these items is prohibited from carry-on baggage. The rest are all approved. I think they recently started allowing knitting needles and the hand stuff should be o.k.. They also allow kids scissors if they are rounded on the end. You say pointed so probably not. And I’ll guess the computer cable. You’re right: knitting needles are fine, as is the hand sanitizer. 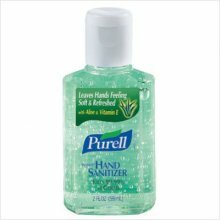 The TSA only limits quantities of hand sanitizer. I had a 2-oz container of hand sanitizer in my bag, the TSA agent found it in a hand search trying to find the offending item, and didn’t even mention it. The sharp, 4-inch scissors are okay, as well as the computer cable. I recently found I’d been carrying a folding Leatherman knife on several trips. Oops – glad I didn’t have to surrender that longtime treasure. However, on a related note, at least I had to take off my shoes! If you’re willing to wait the 20 minutes, you can put your knife in checked baggage and pick it up at the end of the flight. It wasn’t worth it for me to keep the little screwdriver, not even a cool, green Picquic Teeny Turner. Screwdriver bits ARE allowed. Only drill bits are not allowed. There is a difference. Don, that’s what I tried to tell the TSA agents, but they pulled the trick of referencing a regulation they couldn’t show me or even give me a cite to. There’s no way to fight TSA without risking arrest and an expensive legal battle.